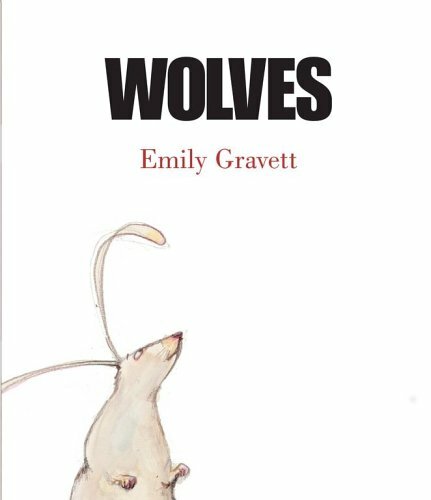 Read an interview with Emily Gravett about Wolves on the Pan MacMillan website. Read another interview with Emily on Seven Impossible Things Before Breakfast. Visit Emily Gravett’s website to look inside Wolves and her other books. Vida Kelly brought this book in to show us when she spoke to our class about children’s book design. She used it as an example of a book where she, as designer, hadn’t actually had to do too much work because the author and illustrator, Emily Gravett, already had such a good awareness of designing a picture book. It’s a really awesome book. Firstly, it has this whole book-within-a-book thing going on that is illustrated by the pictures: as the little rabbit reads, you read over his shoulder. Sometimes the text of the story is that of the Rabbit’s library book (shown by including it on the book in the illustrations) and sometimes it’s the text of the story in your hands, in which case it’s off to the side. There’s never too much text on the page and I think that this is an excellent example of illustration and text fitting in and working together really effectively (which is obviously so important in a picture book). I couldn’t get an image of the endpapers of this book but they were great too: very scrapbooky with the library card and other things.